My buddy sent me an email with an article talking about Izzy being upgraded to 4 inches; which is a 30% screen viewing area increase. Not surprised. Just another tally mark for old faithful. I am really trying to give Andy the benefit of the doubt. She isn’t all bad. For instance, plugging her up to my laptop I found it a breeze to use the GUI provided and transfer movies from my phone to my laptop, and vice versa. Dexter was my guinea pig, and the transfer was flawless. I nodded my head in approval. Granted you can’t change the folder, but was still relatively simple. Now it’s time to upload music, but wait. 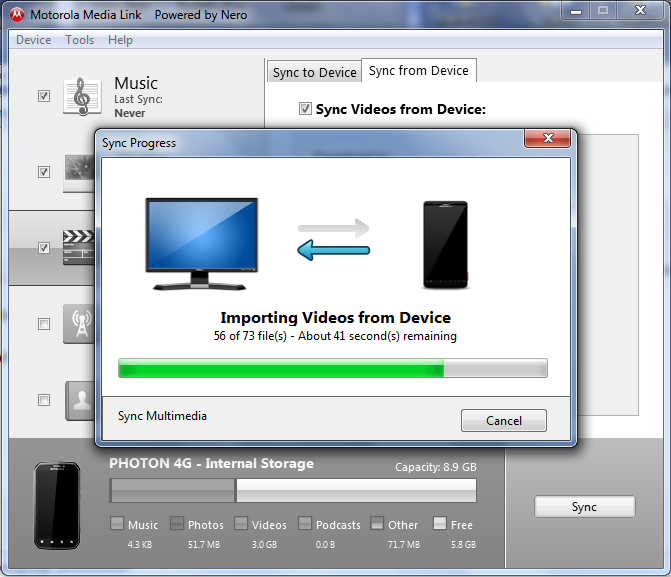 It is making me either sync with Windows Media Player or iTunes? That’s dumb. Immediately I felt the disappointment I initially had with Izzy when I had to use iTunes. I switched to Copy Trans, which I still utilize to this day, but I thought Andy would be different? Granted Andy still has a slight edge if you go to my computer and browse it’s contents. You just have to know where to put it. Guess it depends on if you want to put it where you want, or have your girl guide it in. With me doesn’t matter…depends on my mood. I’ll still give the edge to Andrea on this one. I didn’t have to jump through as many hoops to get what I wanted on my phone. That’s a major plus, so I’ll end it on a compliment today.